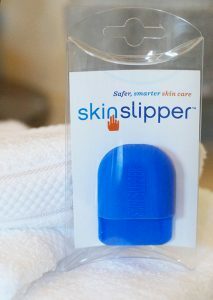 Skin Slipper is perfect for anyone who wants to protect their fingers, eliminate waste when applying skin care products, and safeguard children and pets. Most of these products are applied by using the fingers, causing them to become dry, rough, and irritated; and sometimes stained or bleached. Using facial brushes can be irritating and over-stimulating to the skin. Cotton pads and sponges waste expensive product. Gloves can be uncomfortable to put on and take off. All these disposable products add countless pieces of paper and plastic trash to landfills over a lifetime. Skin Slipper enables the application of medicinal and cosmetic products to the skin easily, comfortably, and effectively.